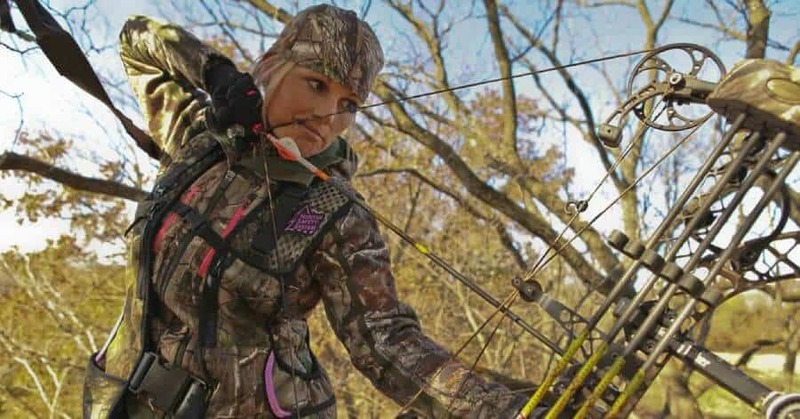 The same point that often applies to people with motorcycles also governs the world of bowhunting, especially to those hunters who often camp in a treestand. It means the level of precautions you take depends on how much you value your life. Fundamentally, being careless enough (or too confident, perhaps) to be on a treestand without any harness means you don’t value your life. With that in mind, you should have the best treestand safety harness to defend you from harm. Otherwise, you deliberately increase the risk of having an injury, or worse, death the next time you hunt. So here are the Best Treestand Safety Harness today as ranked. If you want to settle for something a lot more basic yet still quite functional, the Big Game Ez-On could be your best choice. It comes with a very affordable price, yet it could still function beyond what you pay for. Comfort is the first thing you'll notice when wearing this, thanks to the non-bulky padded shoulder strap design of the product. You can also ensure safety as the Big Game Ez-On conforms to the standards of TMA; the product is certified. The brown color and the camo details assist you in being out of sight, just as how it's supposed to be. The design could easily blend in most environments. You can pair it with another camo cloth underneath for a more effective concealment. Should you accidentally fall from a tree, the Big Game Ez-On is there to save the day. The fall arrest harness comes with an SRD strap, lineman's belt, and a tree belt. Adjusting the harness is also quite easy; you only have to alter the quick-release buckles, and it will do the rest. 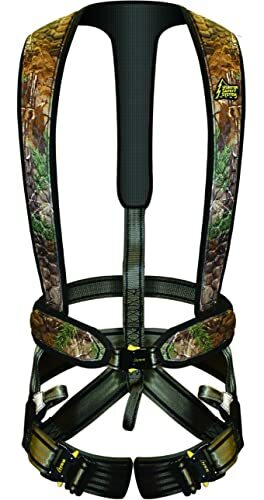 You'll also love the deer drag assist feature of this harness; it has a dedicated strap in the back which you can utilize to 'drag' the game after you hunt. The harness offers hands-free operation once you're hooked up. With all the nice features, you'd really agree when one says this is an ideal harness for the price. It is sturdy and fits well; you can wear it easily as the clips have the same principle as a conventional seat belt. Though, don't forget you'll mostly get only the basics as the name suggests. However, it will do just well. 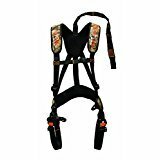 If you're looking for a lightweight treestand safety harness, then the X-1 Bowhunter could be your ideal choice. At a mere 2.5 lbs, the X-1 Bowhunter is the latest today in the market regarding affordability. The straps feature a camo-like appearance, giving you adequate concealment when you try to hide in one of your favorite tree shelters. The X-1 is also comfortable to wear with just enough straps and essentials to keep you safe. It doesn’t have too much paraphernalia like other safety harnesses in the market which often cause confusion in some people as to how to properly wear them. The X-1 is different; it gives you less hassle without sacrificing the factor of safety. For instance, you won't encounter bewildering weave-through buckles and risky dangling straps that actually pose more harm than safety. If you're looking for a harness with an available small size, the X-1 is also a nice choice. You could also allow your son to use this because the small size might fit him. When it comes to mobility, you'll be astounded as how lightweight the X-1 could be. With only 2.5 lbs, you can carry this harness around all day without feeling too much stress. You'll also like the idea as to how this strap could become so quiet even when the temperature drops. The X-1 Bowhunter is also compatible for use in all types of seasons; from summer to winter, you name it. You also don’t have to worry about clothing concerns; you can wear just any lightweight clothes you like. Wearing cold weather gear underneath is also nothing to worry about. The package includes Suspension Relief Strap, Primary Treestrap, a DVD, and a Safe-Use Instructions Manual for your reference. Also, the T﻿reestan﻿d Manufacturer's Association (TMA) recognizes the X-1 as a certified safe product for any hunter out there as it adheres to all the standards set by the said association. The Tree Spider Speed Harness is something you can wear both outside and inside your primary clothing, giving you the idea of how fit and comfortable this harness can be. The reinforced stitching, rollers, buckles, and webbing are all robust and of high-quality, leaving you no regrets when you purchase one. The black shoulder straps have a strong build and are meticulously padded. The webbing also goes all the way to the black padded back panel where the carabiner and bungee attaches. This Tree Spider looks as robust as it really is. The webbing consists of multiple colors; a cool blend of black, bronze-grey, and silver-grey. The second and third color can be seen in the lower half of the harness; together, they give the harness a decent look. This Tree Spider could fuse well with any camo undershirt. The harness fits very comfortably despite having no vest. The superb padding gives you utmost ease, making the harness function more than how you expect it. 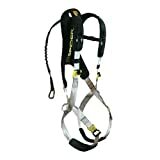 The Tree Spider Speed Harness have an integrated SRS on the harness itself which is one of the most intelligent things the manufacturer did in designing this harness. On the contrary, other makers produce a supplemental suspension relief strap the user must maintain clipped on them or in a pocket all the time. However, Tree Spider managed to make things smart and easier by attaching the SRS to the harness itself. The Tree Spider Speed could easily compete with the HSS UltraLite. However, the latter wins in terms of looks while the former is a little bit smarter in design. Overall, the Tree Spider Speed is the harness that won't put your hundred bucks into waste. It is comfortable to wear and has multiple features you can benefit from. Shock absorbing bungee tether and vertical climbing loops. If you're looking for the best lightweight harness, your search stops here. The UltriLite Flex is the most flexible and most lightweight harness you'll ever find today. At only 2 lbs, this harness is amazingly light. Additionally, it's surprisingly comfortable to wear. The price is totally worth it. 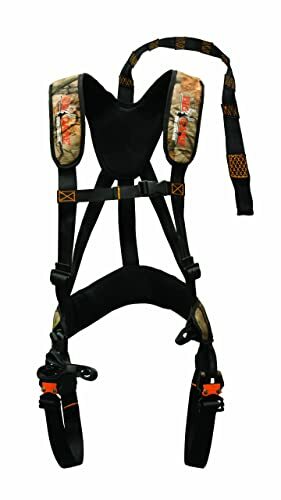 You'll also like the distinct design of this harness; you'll have a beautiful camouflage design that is unlike any other harness in the market. It features a cool blend of earthly elements along with multiple colors in a series of individual, padded hexagons. You'd be proud to wear this harness that feels so premium. The hexagonal patterns also provide a snug and comfortable fit with a touch of ultimate flexibility. Yes, it's snug, but it still gives you the freedom to move without feeling almost immobile. The UltraLite Flex is everything you could ask for in a less-weight and less-bulk harness; it is incredibly robust just like what you would expect from an HSS. The highlight of this harness is it's extremely lightweight some people would say you would forget you're wearing one. The bulk and weight are further reduced by the shock absorbing tether and waist buckle together with 1.25" upper-body webbing. You also get to say goodbye to weave-through buckles and dangling straps; both of which are actually dangerous. Just when you think you don't have room for your essentials, the UltraLite Flex has mesh cell phone pocket so your means of communication is just one pull away. Overall, the UltraLite Flex is the lightest treestand harness not just in our list, but probably in the entire market today. If you're looking for the most versatile harness, you're search ends with the HSS Patriot. What makes this harness distinct among other products in the market today is it can be worn on both sides – the vest is reversible, accommodating your specific needs right when you need it. You can hardly find something as versatile as the HSS Patriot today. On one side, the Patriot features a tricot hunter orange. On the reverse, it boasts Realtree® Xtra™ camo design. What makes the reversible design even more attractive is it offers the same, exact protection on either side. So whether you choose for the tricot orange or go for the diguise-expert camo, you get the same level of safety. Unlike some of the other products mentioned in this article, the Patriot is a vest, and not just a sole harness. It means this product could hold more features than others. For instance, you'll surely like the deep pocket which gives you more than enough storage for your accessories. Despite being a vest, the Patriot is surprisingly lightweight – almost like most harnesses. Thanks to its slim design, you wouldn't feel too much weight when wearing the vest. 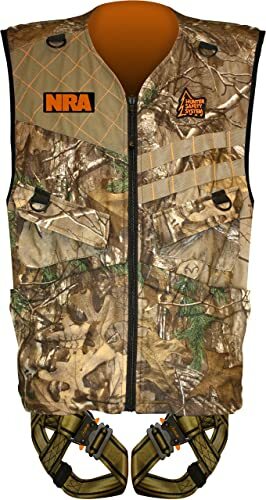 The vest also offers a snug fit without sacrificing mobility; you'll still be able to go bowhunting with complete freedom in your movements. You'll also appreciate how the leg strap buckles are quick to wear. Matter of fact, the whole gear is easy to wear. It doesn’t have any unnecessary parts which could slow you down, or worse, jeopardize your activity. If you're looking for a superior quality vest, the versatile HSS Patriot is the ideal choice. With its cool looks, unique reversible style, and other features, you got yourself the perfect companion when bowhunting. Here are some tips on how to choose the right harness. The right fit feels like a great boot. If it’s not comfortable when you test it, then it’s not going to be comfortable in the treestand either. So don’t hesitate to send it back to the seller when you’re not comfortable to wear it. When testing, wear the same clothes that you’ll wear in the treestand during the actual hunting season. Harnesses are generally worn over your base layer and under your shell. When you tighten the harness, try simulating as if you are drawing your bow. Assess whether you feel comfortable or not. When drawing your bow, make sure you don’t catch your sleeve on a snap or a buckle. Lastly, make sure the weight of the strap suits you well. If it feels heavy, you can change for a more lightweight one. You should also ensure the harness you’re using has passed the standards of the Treestand Manufacturers Association. The TMA standards are a set of criteria to certify that a certain harness is safe or not. A TMA certified harness means it is safe for use. A treestand harness is the key to avoid falling into an injury or fatality, in worse cases. Here are some tips to live by. A safety harness has 3-5 years to “live.” Beyond that, it’s considered as expired. The time starts at the day the harness was actually made, and NOT on the day you bought the item. There is no excuse not to wear a treestand safety harness; it means life and death. 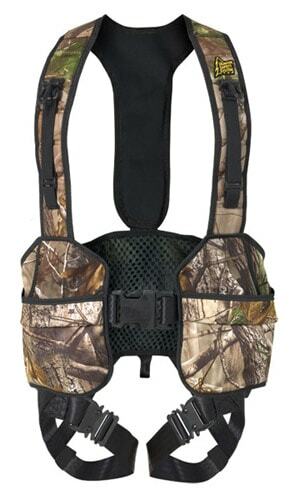 If concealment is your issue, there are lots of harnesses with colors that easily blend in the environment. Before using them, always check your ladder and harness and observe if there are any damage that could jeopardize your operation. A small damage taken for granted could become greater in the long run. Choose your tree wisely! There’s no use of having a high-end treestand and a sturdy harness if the tree you’re using is feeble. Hang your stand only on healthy trees that meet your manufacturer’s recommendations and specifications. Do not choose trees that show signs of rot or damage. Your rifle or bow must NOT be put in your back when you climb to your treestand. Instead, climb first to your treestand then use a rope to raise your gear to your spot. After your activity, climb down first then use the same rope to bring your equipment down. Selecting from a sea of products in the market has become quite easier with this article. Our verdict for the best harness goes to the Hunter Safety System PATRIOT due to its versatility (can be worn on both sides) and it comes from a reputable brand. If you’re not looking for a vest but is rather satisfied with a harness, then the Hunter Safety System UltraLite Flex is your best bet as it comes with a very cool design with a robust build. If you want to try another brand, the Tree Spider Speed Harness is just at par with the HSS UltraLite Flex, with an added benefit of a smart design! 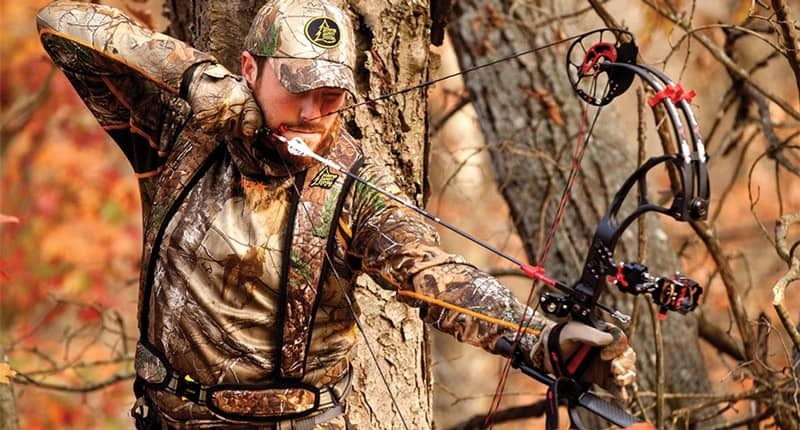 If you just want a basic harness that could keep you safe without spending too much, you can choose between the X-1 Bowhunter and the Big Game Ez-On Basic; both products come at an extremely affordable price. So that’s it. I hope this article have helped you big time in choosing the best treestand safety harness. Happy hunting!